We believe knowledge is the most important business asset. And we understand that the way knowledge flows through your organisation and to your customers can be critical to business success. Streamliners helps other organisations to capture, share, and maintain their knowledge. We do this by providing audience and content analysis, design, writing, maintenance, and publishing services. Our technical communicators create and publish content from a single-source platform to any combination of web, mobile, and paper formats. 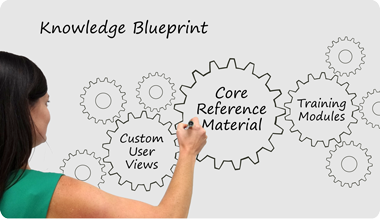 We work with subject matter experts to create policies and procedures, SOPs, software help, and machine instructions. We produce both the reference material and the interactive training packages, and keep the two in sync. Our team works with our clients to adjust the language and writing style to suit the audience, edit for consistency and clarity, plan the output format, link related information, lay it out, and publish it. We also provide web hosting of the published outputs, and sophisticated systems to keep track of content in development, monitor usage, manage user feedback, and help clients to regularly review and update their content.